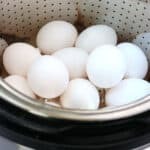 Grab your pressure cooker to make these Perfect Instant Pot Hard Boiled Eggs. Easy to cook, easy to peel, and ready in no time at all. Great for deviled eggs and great for salads too. Place steamer basket or trivet in Instant Pot. Place eggs and add water. Allow to sit for 5 minutes then quick release. Carefully transfer eggs to bowl filled with ice and water. Allow to cool until able to handle.